The AASHO Road Test, a $27 million (1960 dollars) investment and the largest road experiment of its time, was conceived and sponsored by the American Association of State Highway Officials (AASHO) as a study of the performance of highway pavement structures of known thickness under moving loads of known magnitude and frequency (Highway Research Board, 1961). The test studied both portland cement concrete and asphaltic concrete pavements, as well as certain types of short-span bridges. The information obtained from the AASHO Road Test was crucial in advancing knowledge of pavement structural design, pavement performance, load equivalencies, climate effects, and much more. The basic performance information resulted in the performance equations and nomographs used in the AASHTO Guide. This section provides some background information on the AASHO Road Test. It should be helpful in understanding the experiment’s strengths, weaknesses and limitations. This section provides some of the basic background for the AASHO Road Test and is taken primarily from Highway Research Board’s Special Report 61A, The AASHO Road Test: History and Description of the Project (1961). The AASHO Road Test site (which eventually became part of I-80) at Ottawa, Illinois, was typical of northern climates (Table 1). Figure 1: Loop 5 and 6 AASHO Road Test layout (redrawn from Highway Research Board, 1961). 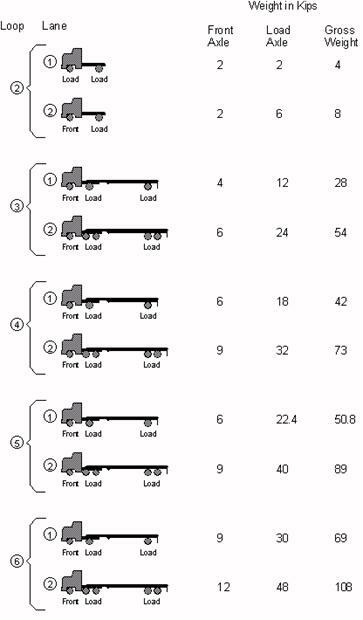 Figure 2: Axle weights and distributions used on various loops of the AASHO Road Test (redrawn from Highway Research Board, 1961). The primary materials used in the HMA pavement sections will be briefly described below. This kind of information is helpful in comparing a particular project’s set of materials to those used at the Road Test. The gradation requirements for the surface and binder courses are given in Table 2. For the HMA surfaced test sections (in Loops 3-6), the surface course was 1.5 inches thick. The HMA mixes were designed by the Marshall method using 50 blows per face. The typical field asphalt contents were about 5.4 and 4.4 percent by weight of total mix for the surface and binder courses, respectively. The field air voids averaged 7.7 percent for the six test loops. The base course material was a crushed dolomitic limestone that conformed to the gradation range shown in Table 3. It is significant to note that 10 percent passed the 0.075 mm (No. 200 sieve). Thus, the base was likely a bit frost susceptible. The CBR of the base material averaged 107.7 percent based on laboratory tests; however, the test results ranged from a low of 52 percent to a high of 160 percent (total of 11 tests). The minimum specified CBR was 75 percent. Typical in-place mean dry densities were about 2242 to 2275 kg/m3 (140 to 142 lb/ft3), with mean moisture contents ranging from 5.6 to 6.1 percent. The subbase material was a sand-gravel mixture which conformed to the following gradation range shown in Table 4.